A strange brew, but likeable too. Inside, Quad’s new Vena is a brand new, high quality, Class AB amplifier with a solid 45W RMS per channel (quoted). It sports a Cirrus Logic CS4398 DAC, as used in Quad’s Platinum series CD players, and aptX Bluetooth connectivity, making it very flexible for those with music on their computer or smartphone. Should you choose to enjoy music via physical media, then there are two RCA line inputs for turntables (via a phono stage), cassette decks, radios and suchlike. On the outside, its styling could have come from the nineteen sixties. Particularly in its standard Lancaster Grey finish, it is totally trad Quad, which is a good thing if you’re a Quad fan, but not every potential Vena purchaser necessarily is. I love its packaging; at 93.5x313x302mm (HxWxD) and 6.18kg, it is compact and rather redolent of the 33/303 era. It looks subtle, understated and finely finished – especially considering the modest £600 retail price. But I suspect many prospective customers may be searching for something that’s more 2015 than 1965? Those seeking a little less visual austerity may take up the option of the more exotic, optional gloss finishes for £100 extra. The new baby Quad sounds clean, crisp and surprisingly musical. It sits in that happy place where the sound is peppy and fast and engaging, yet doesn’t get too forward, harsh or searing; the company has delivered exactly the right balance, and the result is a civilised performer that’s enduringly enjoyable. By the standards of higher end Quad electronics, you lose a bit of detail, depth, bass power and treble extension, but it’s still a surprisingly capable performer at the price. The analogue inputs are great, whereas the DAC section sounds a little different. It’s tighter and more grippy, more immediate and more solid sounding, although it doesn’t quite have the naturalness and ease that you’d get from the analogue outputs of a higher end CD player. 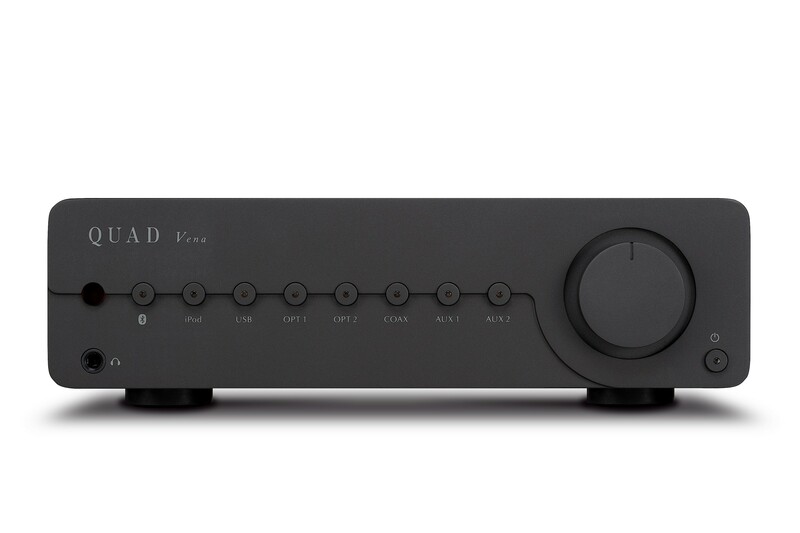 If you’re lucky enough to have a decent digital source, then the trick is to use the DAC for playing out music from a Mac or PC, DVD or Blu-ray player, and keep the analogue inputs for your best sources. Regardless of input, the Vena comes over as tonally even and neutral, with few obvious failings. There’s just a touch of dryness and owners of brighter loudspeakers might think its upper midband to be slightly ‘well lit’ but is never over-intrusive, and again at the price is beyond reproach. It seems to have plenty of power, with good dynamics able to capture the accenting on loud rock music, although will run out of steam in a large room with small loudspeakers; admittedly an unlikely combination. Its wireless interface is aptX Bluetooth, and this works well as these things go, but you wouldn’t want to use it as your main source for serious listening. Despite what some have said about how good it can sound, it doesn’t come close to a conventional lossless, wired digital source; the music sounds more grainy and the soundstage gets flatter, moving away from its original three dimensions. Quad’s Vena is at its best via its standard analogue inputs, but makes a nice noise with digital and how can you not love that subtle retro styling? Those who do will find it an excellent value, do-it-all design.